The Hydrothermal Dynamics of Yellowstone LAKE (HD-YLAKE) project seeks to understand how earthquakes, volcanic processes, and climate affect the hydrothermal system located beneath Yellowstone Lake. The northern half of Yellowstone Lake lies inside the Yellowstone volcanic caldera, and hosts more than 250 hydrothermal vents and dozens of explosion craters that are hidden from view on the lake floor. Though difficult to access, this hydrothermal system provides an ideal natural laboratory to study cause-and-effect relationships between tectonic, magmatic, climatic, and hydrothermal processes because it is unusually sensitive to perturbations. With major funding from the National Science Foundation (Integrated Earth Systems program) and major support from the US Geological Survey (Yellowstone Volcano Observatory), the HD-YLAKE project uses novel techniques and instrumentation to study the lake floor vents. Our research activities include components of geochemistry, seismology, geology, geodesy, heat flow, micropaleontology, limnology, paleoclimatology, statistics, analytical modeling, and numerical modeling, and our multi-disciplinary team includes investigators from more than 10 different institutions and organizations inside the US and France. 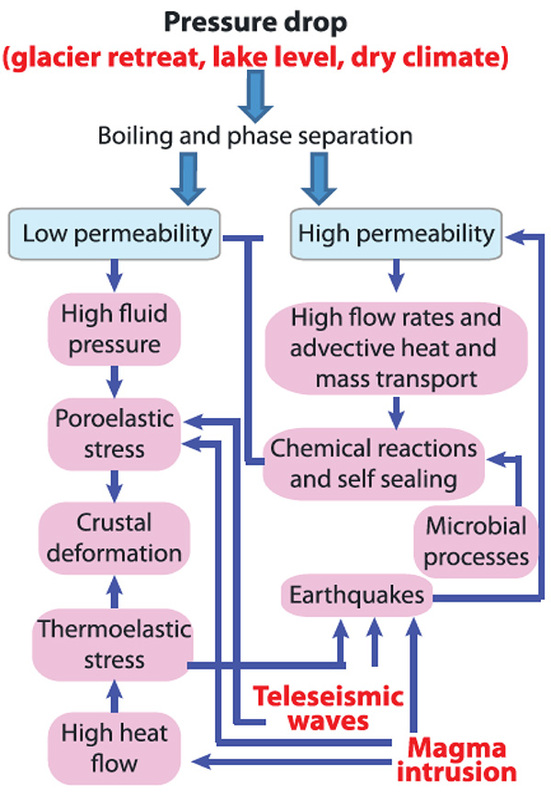 Hydrothermal systems are generated by a complex set of dynamic processes that transport and redistribute heat and mass within and through the Earth’s crust (Fig 1). Continental hydrothermal systems are relevant to our society because they are a primary source of economically important metal deposits, provide geothermal resources, and support exotic, chemosynthetic ecosystems that are believed to be similar to the earliest life forms on Earth. Figure 1. 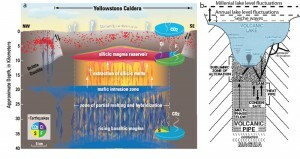 (A) Schematic cross-section of the crust beneath the Yellowstone Caldera. Red dots represent earthquake epicenters. The silicic magma reservoir is responsible for most of the volcanism over the past 2.1 million years and overlies a middle and lower crust invaded by mantle derived basalt. The silicic magma is a hybrid of crustal melts and residual liquid formed as mafic magma cools and crystallizes. Magma rises closest to the surface (5?7 km depth) beneath the resurgent domes. Pie diagrams compare the relative abundances of volatiles emitted from the Yellowstone hydrothermal system (top) with the abundances of volatiles dissolved in Yellowstone rhyolites (middle) and hotspot basalts (bottom). The CO2-rich hydrothermal system appears to reflect the basalt dominated crust below. From Lowenstein and Hurwitz, 2008. (B) Illustration showing processes that may occur in and below volcanic lakes. The volcanic conduit may have multi-phase flow and/or a heat pipe. The sublimnic zone of alteration is subject to recirculation of acidified lake waters leading to rock alteration, precipitation of metal sulfides and/or sulfur, and reinjection of the resulting brines back into the lake through hydrothermal vents. From Pasternak and Varekamp, 1997. The HD-YLAKE project seeks to understand the inter-relationships between the driving forces behind hydrothermal circulation: magmatism, tectonism, and environmental forcing, through a combination of field studies, data analysis, and modeling (Fig 2). Figure 2. Schematic showing the coupled processes operating in magma hydrothermal systems in response to decompression, local and remote earthquakes, and magma intrusion. From Hurwitz and Lowenstern, 2014. The project is sited in the northern half of Yellowstone Lake, which hosts one of three major thermal basins in Yellowstone National Park. While most of the thermal activity in Yellowstone discharges into pools, fumaroles, and geysers that can be observed on the ground surface, the system beneath the lake discharges through a series of vents and fissures onto the lake floor, where it is hidden from sight. This thermal system is particularly sensitive to perturbations, making it an ideal location for studying the cause-and-effect relationships between magmatic, tectonic, and environmental activity with hydrothermal circulation. The extreme sensitivity of the system to perturbations is evidenced by the fact that the northern part of Yellowstone Lake hosts the largest known hydrothermal explosion craters in the world, which are generated when the pore pressure in a system suddenly drops, causing catastrophic vapor explosions that can excavate large volumes of rock and fluid. The HD-YLAKE project brings technology developed for studying hydrothermal processes in the deep-sea to Yellowstone Lake, allowing us to gain unprecedented insight into how the hydrothermal system responds to forcing. The project will feature 3 consecutive field seasons from 2016-2018, during which we will monitor a set of hydrothermal vents on the lake floor with a variety of geophysical and geochemical instrumentation, and take a set of 6 piston cores from key sites. The monitoring data will provide detailed information about how the modern system responds to perturbations, and the cores will allow us to understand how the system has responded to major events throughout the lake’s post-glacial history. Figure 3. 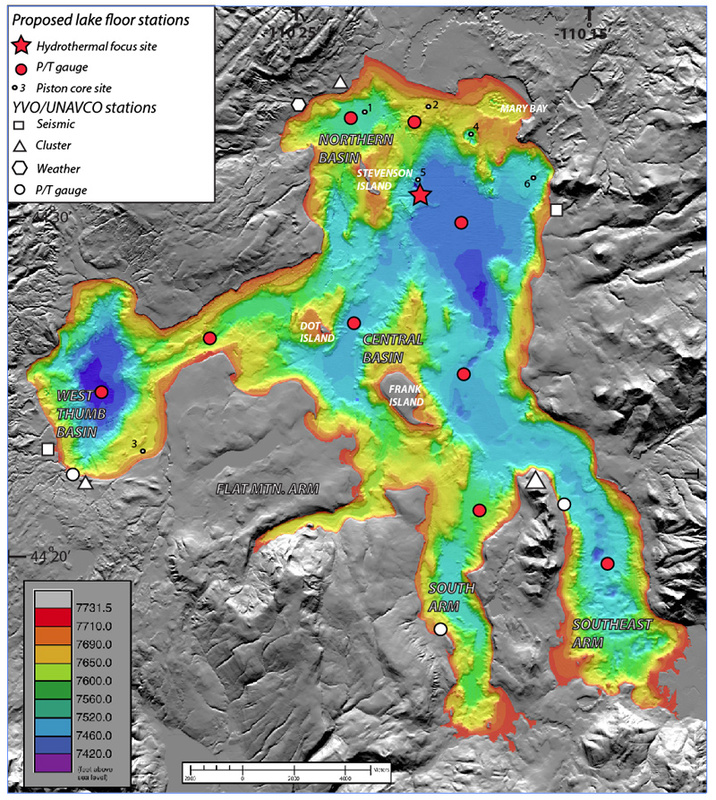 Bathymetry of Yellowstone Lake with location of planned instrument deployments and coring targets for 2016 field season. The HD-YLAKE project is funded by NSF’s Integrated Earth Systems program with major in-kind support from the USGS Yellowstone Volcano Observatory. Click here to read the National Science Foundation project proposal summary. Lowenstern, J. 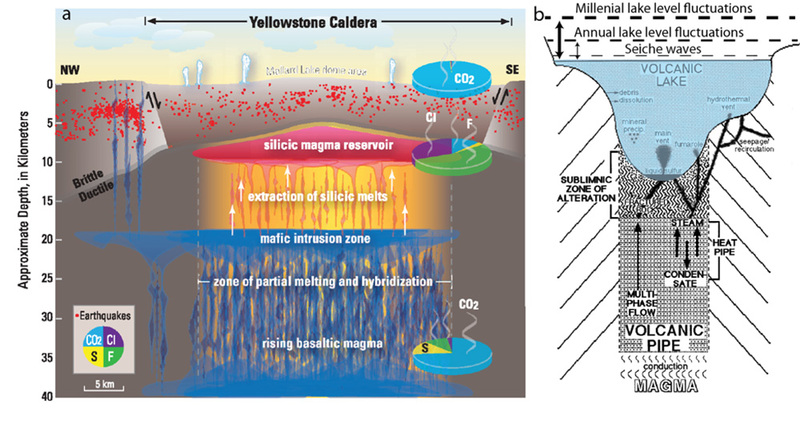 B., and S. Hurwitz (2008), Monitoring a supervolcano in repose: Heat and volatile flux at the Yellowstone Caldera, Elements, 4, 35-40, doi:10.2113/GSELEMENTS.4.1.35. Hurwitz, S., and J. B. Lowenstern (2014), Dynamics of the Yellowstone hydrothermal system, Rev. Geophys., 51, doi:10.1002/2014RG000452. Pasternak, G. B., and J. C. Varekamp (1997), Volcanic lake systematics I. Physical Constraints, Bull Volcanol, 58, 528-538.